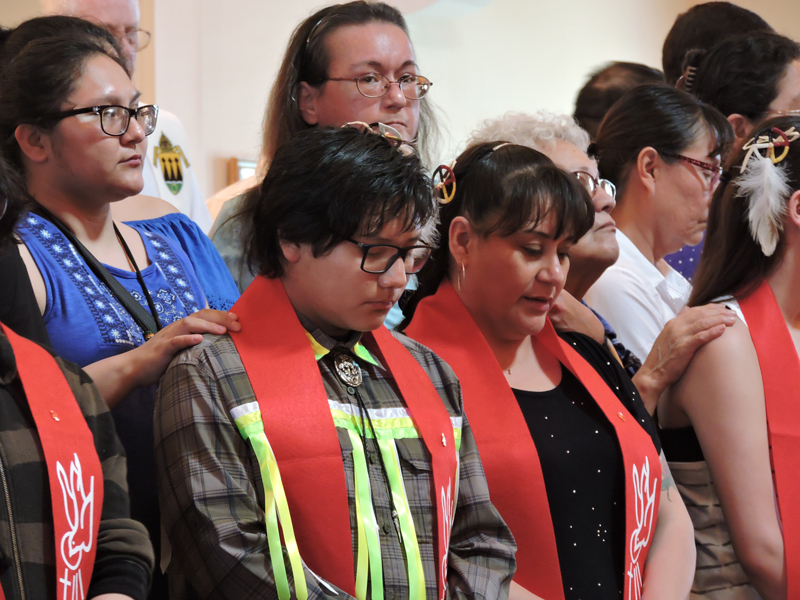 Each spring, members of Red Cloud’s parishes come together on campus to honor those who have completed the spiritual journey of being confirmed in the Church. This year, as their families and loved ones looked on, 21 Confirmation candidates completed their final rite of passage into the Catholic faith during a special Mass and celebration. 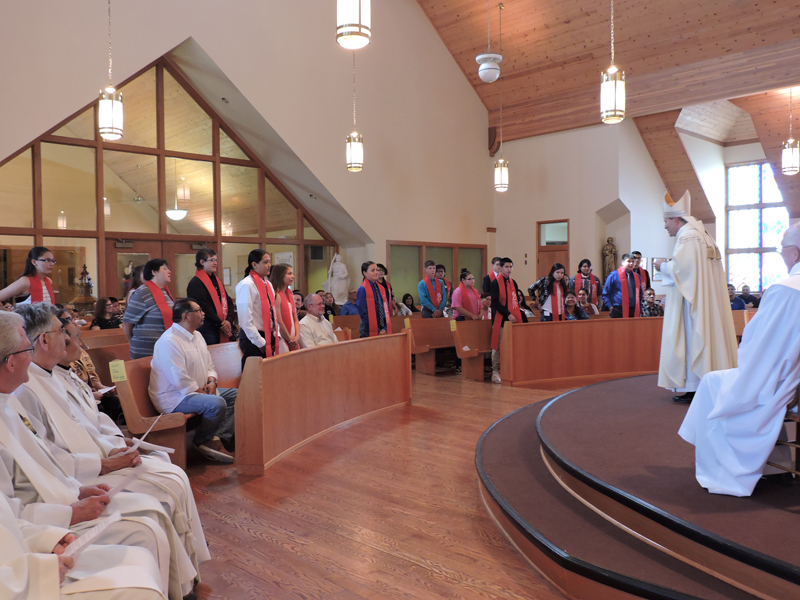 Adorned by a Confirmation stole as a sign of their entrance into greater service in the Church, each candidate was blessed and anointed with holy oil by Bishop Robert Gruss of the Diocese of Rapid City. And in honor of their Lakota heritage and culture, each candidate received an eagle feather or plume to mark this significant moment in their spiritual lives. Candidates worked for nearly a year to prepare for their Confirmation—attending weekly classes and two full-day retreats. Jules, a seventh grader from Christ the King Parish, was one of the candidates who took part in this year’s service. During the time she spent preparing for her Confirmation, she reflected often on why this journey was so important to her. Throughout the preparation process, candidates had the support and guidance of many, including parish staff, friends, and loved ones. Catechists—parish leaders who give their time to help candidates understand the deeper meaning of the Confirmation process—taught the preparation classes and offered their own insights. They helped each candidate select the name of a saint whose story inspires their own spiritual journey, and who stands out to them in the way they gave their life for others. This year, close family relationships between candidates and catechists made the celebration all the more special. There were several sets of cousins and siblings being confirmed together, and even an extended family of four—a mother, her daughter, and her two nephews. Susan, an adult candidate from Sacred Heart Parish, joyfully shared the celebration alongside her grandson as he was also confirmed. All candidates choose a Confirmation sponsor—someone who has helped them see how to live a life rooted in faith—to guide them. During the celebration, as prayers were offered in both English and Lakota, each candidate’s sponsor, relatives, and friends all promised to continue to support them in the next phase of their spiritual lives.